How Straight was the Green Creek Power Line? 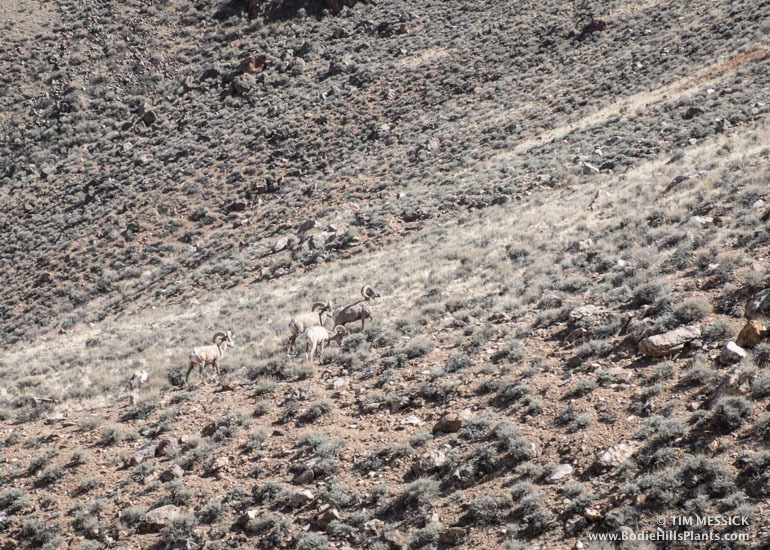 One of the popular myths about Bodie—because it makes a great story—is that the Green Creek power line, built in 1892 to run equipment in the Standard Mill, was an absolutely straight line. The reason, supposedly, was that its builders were concerned the electricity might jump off the wires and get lost if the line was not straight. Fun story, but it doesn’t hold up to close scrutiny. Yet the facts, if scrutinized, are still interesting. 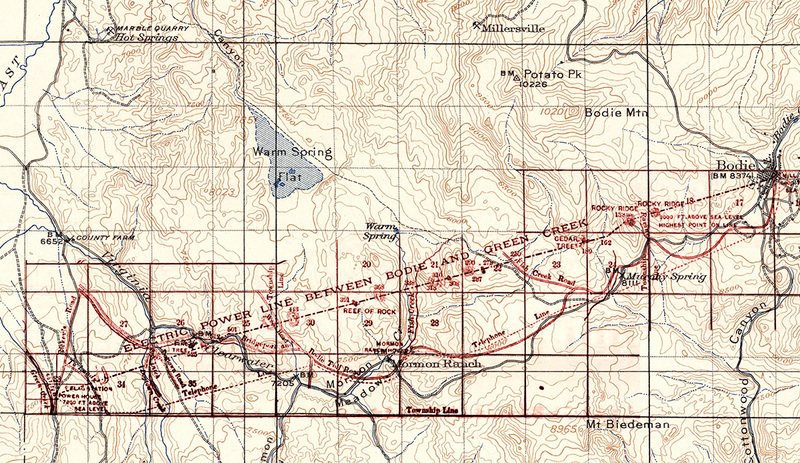 The map is not very detailed—it shows the power line, selected pole numbers, section lines, roads, creeks, a few summits, and a telephone line to Bodie. The power line itself appears to have been mapped with some precision with respect to section boundaries. If you overlay the 1894 map on the 1909 US Geological Survey topographic map and register the two along the section boundaries (see below), the alignment and selected topographic features appear consistent with the 1909 topography. But the roads and creeks on the 1894 map are at best rough approximations of where topographic maps show them. The makers of the 1894 map were surveying the power line, not the roads or creeks, and had no aerial photographs for context. Was it straight? That depends on how you look at it. In plan view (map view), it was very nearly straight. This makes good sense, regardless of any concerns about losing power at bends or corners, because the straightest line is the shortest line, which is also probably the least expensive line to build and the quickest line to finish. According to the 1894 map, there were two or three slight bends where the line ran through the shallow canyon of lower Clearwater Creek. There were two more slight bends as it crossed a ridge and steep slopes north of Murphy Spring. Although not shown on the map, or maybe not visible at the scale of this map, I expect there was another bend or two as the line approached Bodie. If not, the line would have run directly through the IOOF Hall and Dechambeau Hotel—not likely, I think. In profile view, the power line was much less straight. It crossed about a dozen substantial gullies or creeks, with about as many sizable hills and ridges in between. Some had steep slopes exceeding 40 percent. If you trace the approximate alignment from the 1894 map onto Google Earth, you can view its profile (below). The horizontal scale is greatly compressed, which accentuates the slopes and angles, but it’s hardly a straight line. When electricity came to Bodie in November 1892, long-distance transmission had been proven, but experience was limited. The project at Bodie had its skeptics and Leggett, who built the Green Creek Power Line, was of course a strong proponent. There was great excitement and relief when the first electricity arrived and set the motors spinning, but I doubt the engineers were too concerned that it wouldn’t work. 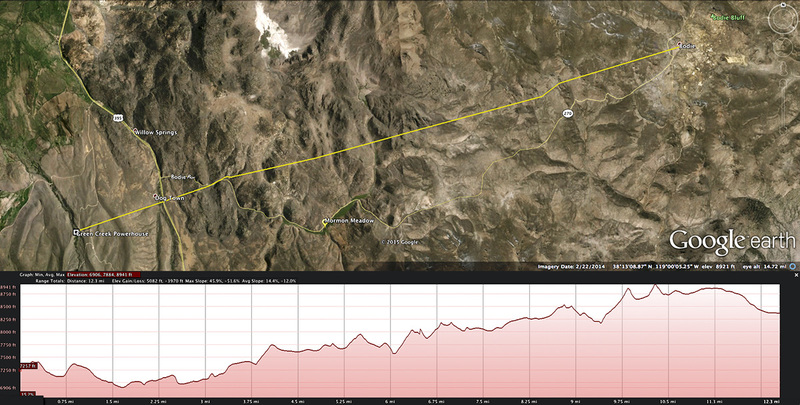 “The length of the line is 67,760 ft., or 12.46 miles. The poles are of round tamarack timber, 21 ft. long, 6 in. in diameter at the top, set 4 ft. in the ground; poles 25 ft. long being used through the town, and along the line wherever there is danger of deep snowdrifts. They are placed 100 ft. apart, and fitted each with a 4 by 6 in. cross-arm, boxed into the pole, and held by one bolt and one lag-screw. “Tamarack” has been used over the years to refer to a few different kinds of trees. Among plant people, “tamarack,” or “tamarack larch,” now usually refers to Larix laricina, a deciduous conifer native from the northeastern United States across much of Canada to Alaska. The nearest native stand is over 800 miles from Bodie. 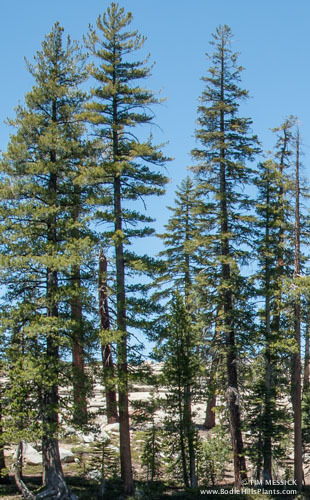 In the past, the tree we now commonly call lodgepole pine (Pinus contorta) was sometimes called “tamarack pine,” or just “tamarack.” Lodgepole pine has a growth form well suited to electrical poles, and is abundant on the east side of the Sierra Nevada, not far from Bodie. © Tim Messick 2015. All rights reserved. 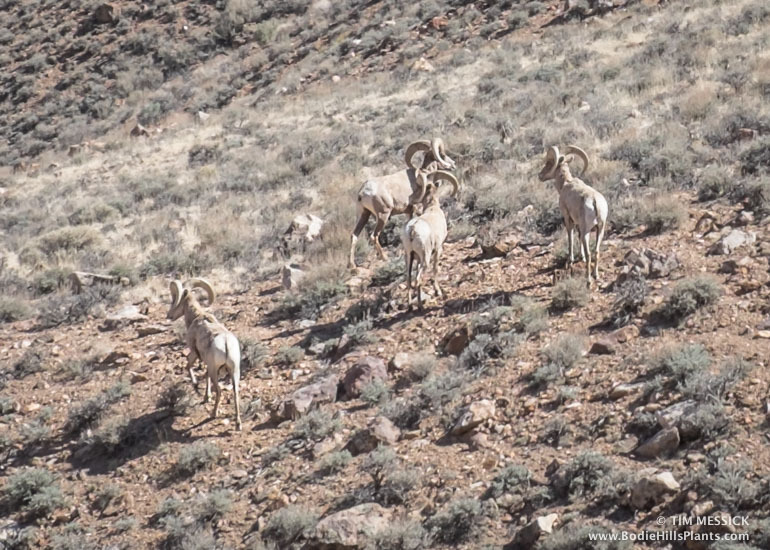 Last weekend (in late March), I drove east along the north edge of the Bodie Hills, following the well-graded forest road NF-028. 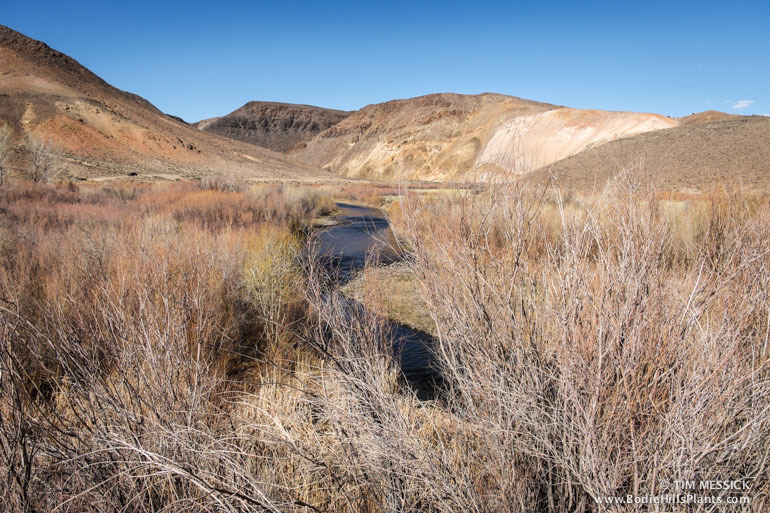 The East Walker River flows east here between the Bodie Hills to the south and the Pine Grove Hills to the north. 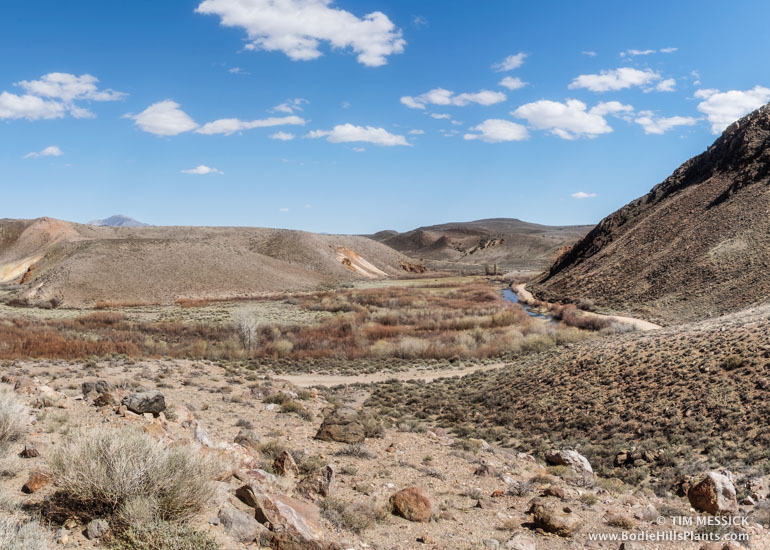 In a canyon at the edge of Fletcher Valley, the river makes a couple of sharp bends at a place called “The Elbow.” From here the river flows north toward Yerington. 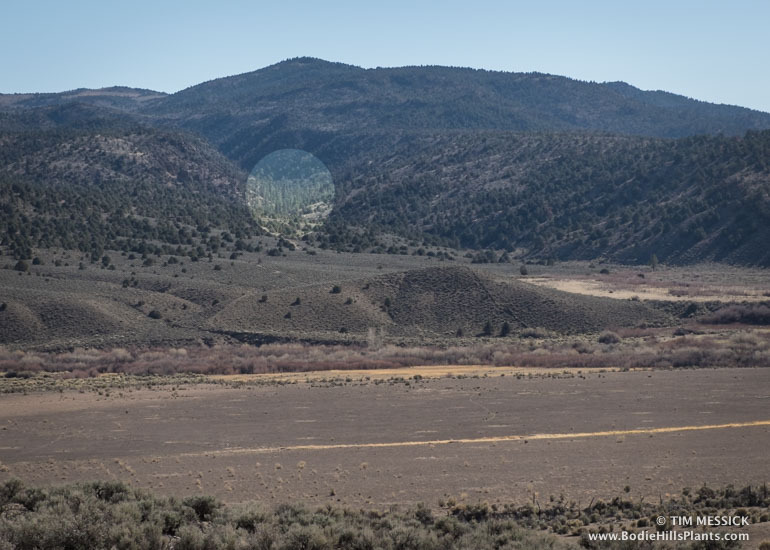 Another interesting view along NF-028: from where the road crests a hill just east of the paved highway (Nevada 338), you can look south across the valley of the East Walker into the bottom of Masonic Gulch. With binoculars, you can make out a stand of Jeffrey pine trees (Pinus jeffreyi), part of the largest stand in the Bodie Hills. It continues south in Masonic Gulch to about the California state line.